Like to see the real thing? There is a lot of misinformation about the Former Wisley Airfield. the land is not in Wisley. It is wholly within the Parish of Ockham. the land is not an airfield. 75% of it is agricultural land and grassland and woodland – according to the developer’s own website. Of the total land parcel perhaps only 10% has been ‘previously developed’ ie has had structures on it. the land does not fulfill ANY of the purposes of the Green Belt. This is false. It obviously does. the land is ‘derelict’. This is obviously false. And, even if it were true it would be irrelevant to the purposes of the Green Belt. GBC can take the land out of the Green Belt and replace it with land in Ash/Tongham. This is false. Exceptional circumstances MUST be shown BOTH to add land at Ash/Tongham AND to remove land at Ockham. Any land at Ash would barely be relevant to London’s Metropolitan Green Belt. NO exceptional circumstances have been set out. The site is sustainable. This is false. GBC’s own consultants, Pegasus, give Ockham a sustainability score of 4 points in the Settlement Hierarchy. That is the second worst score in the entire borough. Pegasus states that there are almost no services or facilities in Ockham. The site has good transport links. This is false. The only link available to HGVs is via Elm Corner onto the A3. This access has no acceleration and deceleration lane and is known to be dangerous. Planning permission to build a NEW access for a waste processing facility has NEVER BEEN ACTIONED. The land is therefore conceptually IDENTICAL with any other agricultural land on either side of the A3 between Guildford and Junction 10. There are many videos of aeroplanes at the former airfield. That must make it an airfield? WRONG. They are videos posted by model aeroplane enthusiasts who have permission from the farmer to fly their MODEL aeroplanes from the west end of the former runway. The email below is from the Clandon Residents Association. It gives a good account of what happened at the Council meeting on 19 June at which the draft Local Plan was approved for consultation. Gives references to the webcast – so you can see how your councillor(s) performed. Last night we lost the vote to get the draft Guildford Plan delayed for a review before it went to public consultation by 27 to 14 with 1 abstention. One councillor who could not be there because of ill health had a statement read out that said he would have voted against the plan, four others simply gave ‘apologies for absence’. While this is a setback, we should not underestimate the enormity of what we have achieved. Only two weeks ago it looked as though this would go through with some dissent, but pretty much a walkover on voting as far as the ruling party, Cllr Mansbridge (Leader of the council), Cllr Juneja (leading the Plan), the council’s Executive Committee and the planning officers were concerned – all of whom have been pushing the current draft Plan forward. It was quite clear that Cllr Mansbridge and his team had done a great deal of work behind the scenes to intimidate councillors. At the same time they used appalling scare tactics about the dire consequences of delaying getting the Plan out to consultation – claiming there would be wholesale and uncontrolled building all over the Green Belt which nobody could stop. Mansbridge was quoted in the Surrey Advertiser saying we could have 20,000 houses built on the Green Belt if the Plan was even delayed! Yet last night virtually all councillors from all political parties expressed real concerns about flaws in the Plan – some thanking residents and groups like ours for information and facts received they had not been aware of before. Even most of those who voted for the Plan to go to public consultation expressed grave reservations. To have half of those voting saying ‘No’ to the council’s Juggernaut (in the most literal sense) is, we believe, an extraordinary achievement – bloodying the council’s nose and putting a hefty shot across the bows of those advocating the current Plan. Eventually those advocates had to take the tactic of conceding that the Plan has faults and that these now need to be addressed in the consultation process. So, although we may not have got the vote last night, we, together with the other local groups formed to achieve a sensible and sustainable Plan for Guildford, have managed to make some major inroads in showing that the draft as it stands is unacceptable and will need to be changed – and public acknowledgement from its advocates that this should happen. In addition MPs and even MEPs have got involved and messages spread both up and down the political party lines. For this our huge thanks go out to all of you for your enormous efforts in getting your emails created and sent to all councillors, MPs, MEPs and the planning office, and printing off copies of your letters for distribution to councillors. We are in discussions with the Surrey Advertiser about this and will report back with what we can achieve there in the immediate and longer term future as we seek to get our concerns publicised. We would like to take this opportunity to applaud three of our councillors who stood up against their own party, and the enormous pressures put on them, and voted against the current draft Plan going to consultation in its present format. Cllrs Jennifer Powell, Jenny Wicks and Andrew French each made powerful cases about the proposed school in Clandon, the destruction of the Green Belt and the need to review the current Plan. They were each prepared to state that they would vote against it going to consultation, and had the enormous courage to stand up in public and vote against their party’s instructions. Andrew French stated that it was the first time he had taken this step in 20 years of being a councillor, and Jenny Wicks counteracted Cllr Juneja very forcefully (and out of order according to the Mayor, but not as far as the public were concerned!) when the latter made claims about the former which were patently untrue. Cllr Terence Patrick spoke against the proposed school in a question to a speaker from the public, and used his speaking slot to question why the request by the Scrutiny Committee (which he chairs) for a review of the housing numbers required (652 per year) had been ignored. However, when it came to the vote Terence Patrick voted for the draft Plan in its current state to go to consultation. Although the speakers are listed on the right hand side these seem to be out of sync with the actual video, so we suggest you simply move the progress bar at the bottom of the video to the times we have tested out below to view our councillors’ contributions. Note how she is attacked in questions one after another by Conservative councillors. Mrs Linda Fox, who speaks about being homeless and living sustainably, does not declare that she is actually PA to Dr Malcolm Parry, Director Research Park & University Planning Officer at Surrey University – responsible for the university’s expansion plans, which are a fundamental part of the present Plan, and who reports directly to Greg Melly, university Vice-President who also happened to speak at the meeting in support of the University’s development plans. There is much to be considered from the meeting. In the coming days we will be putting together our thoughts for the way forward, and in what areas we will need your help in seeking to remove the proposals for the school and Gosden Hill Farm. Last night was an education about the pressures political parties bring to bear on the people who, ostensibly, are there to represent us, their residents, and how those who want to see the Plan enacted in its current form are prepared to use misinformation and intimidation to get their way. Our campaign will need to be intelligent, sustained and consistent, and we will need total involvement by everyone who does not wish to see the Clandons and our Green Belt destroyed. We have all achieved much we can be proud of, but we should be in no doubt about the fight ahead. Thank you again for all your efforts and support now and as we go forward. It turns on what circumstances are considered exceptional. Guildford Borough Council (GBC) has stated what it considers to be the meaning of ‘exceptional circumstances’. It can be found at Appendix 4b Sub Appendix A Joint Scrutiny Committee Resolution 8 published in connection with the Scrutiny Committee on the draft Local Plan. The Court is the second highest court in the land. Three judges sit to hear cases. Its opinion is therefore authoritative. This case was cited as a leading precedent by the judge in the Gallagher case only a few months ago. Which of these interpretations do you think is objectively correct? GBC no doubt prefer their own opinion. But it is their own subjective opinion. It is for the courts to interpret the meaning of the policy. 3) The promotion of a ‘new town’ at Wisley – without asking and answering the logically prior question: does GBC need a new town? You might wish to consider whether these exceptional circumstances are consistent with Guildford Code of Conduct and Probity in Planning Code? How was it that the private interest of the developer of Three Farms Meadow (aka Former Wisley Airfield) was promoted in the draft local plan – and mentioned in the first few paragraphs of the drafts of the document? You might expect that since the Lead Councillor for Planning was elected on the basis, inter alia, of her statements that she was a barrister that she would be fastidious in ensuring that all the sites in the draft local plan can be justified by exceptional circumstances. You might expect that the Council would be fastidious in applying its Codes. To include sites for which no exceptional circumstances can be shown would be reckless. Has not the Council been exposed to the risk of adverse judicial review of its decisions? Was this a good use of public money? Que. Who is behind the plan to remove 117 hectares from the Green Belt at Ockham? Ans The land was acquired by a Caymans company called Wisley Property Investments (WPI). It purchased the land from Wharf Land – a Jersey company since liquidated. It is thought that the promoters of WPI are the same or similar to the people behind Wharf Land. But they remain hidden behind the secrecy of their offshore registration – beyond reach of British disclosure rules – and taxes. Que So who fronts up for this company? Ans. The person who consistently speaks on behalf of WPI (but refuses to disclose any information about its owners and financiers) is Mr Michael Murray. He regularly gives quotes to the Surrey Advertiser. Que. Why is he promoting WPI’s change of use of its land at Three Farms Meadow? Ans. Well you’d have to ask him of course. When I asked him whether he has any financial interest in WPI he was evasive. But he has stated that he had no conflict of interest. It is not clear if that means that he is does not personally stand to make money if WPI manages to achieve a ‘change of use’ of Three Farms Meadow. Funnily enough he has an executive position on the Vale of White Horse District Council. 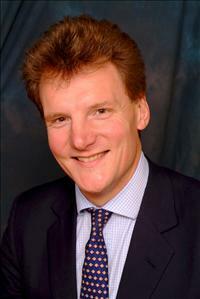 He is ‘Cabinet member for planning policy, including the core strategy’. Que. Aren’t the Conservatives supposed to support the Green Belt? Ans. Yes it was a manifesto commitment of the Guildford Tories, apparently. They do not seem to be living up to their election promises though. Que. Does Mike Murray have any connections with the GBC executive? Ans. Dont know. But he was seen by constituents at one of the GBC roadshows promoting the Local Plan. Apparently he spoke in favour of a ‘new town’ at Wisley. Que. Anything wrong with that? Ans. Yes. People who were there say he did not disclose any affiliation with WPI. So innocent members of the public could have received the impression that his comments came from a disinterested member of GBC. Taken with the fact that WPI and its agent Savilles state that GBC is ‘promoting’ the former Wisley Airfield as a site for a new town it all looks rather cosy. recognise the wishes of Effingham residents of maintaining the Green Belt between Effingham and Bookham when Guildford Borough Council is consulted on the Mole Valley Green Belt review. Members of the public had the opportunity to address GBC on these issues at the Extraordinary Meeting of the Council on 26 February, 2014. The public speakers are not all named on the webcast. You will be left in no doubt that the developers attack on the Green Belt is unjustified. Watch the speakers demolish the SHMA housing figures. Guildford Green Belt Group (GGG) is starting a petition to change the leadership of Guildford Borough Council. Guildford is run by a ‘leader’ called Stephen Mansbridge and a ‘cabinet’ of 9 councillors picked by him – including Ms Monika Juneja who is responsible for the Local Plan process. Despite lengthy, detailed, and repeated exposure of the errors of fact, mistakes, and wrong arguments used in the local plan process the ‘leader’ and his cabinet have taken no heed. The Localism Act allows us to get rid of the ‘Tin Ear’ and replace it with committee government that pays heed to objective facts and listens. Good luck GGG and well done for taking on the ‘leader’! Here is the GGG press release. Guildford Greenbelt Group (GGG), the organisation representing residents concerned by Guildford Council’s plan to build major developments on Surrey’s Green Belt, is to petition for a referendum to remove the council’s Executive Committee and restore a more democratic system. The Group says it has been left with no alternative following the Executive Committee meeting on Wednesday 4 June which ignored demands by the council’s own Scrutiny Committee to revise the Plan’s inflated required housing number of 652 per year before the Plan goes to public consultation. Instead the Executive Committee went ahead and approved the current Plan for public consultation – meaning that the public will be told that 652 is the required figure for housing each year. Susan Parker, Chair of GGG, said: “The Executive Committee has ignored calls from the council’s own Scrutiny Committee to review the housing target and the housing requirement calculations it is based on. “As a result, we feel we have no option other than to petition for a Referendum to return the Council to a more democratic structure which will better respond to residents’ and councillors’ concerns. The Metropolitan Green Belt was created in the public interest by national planning policy to prevent urban sprawl and stop towns merging into each other. An inflated housing number is not in the public interest and jeopardises the permanence and credibility of our Green Belt. Under the Localism Act, councils have to hold a referendum if five per cent of the electorate sign a petition calling for one – in the borough of Guildford, that would require 5243 signatures. The referendum will enable the people of Guildford to choose to support either the Executive system in place at present or a committee structure where the decisions of committees shape policy. At present, the Council is governed by an Executive system, which means the Leader (appointed by the largest party) and nine other councillors (appointed by the Leader) make all the significant decisions. Under the committee system all elected councillors are able to participate in the process of local government, which would mean that the decisions of councillors would be followed and respected. Since 2011, when the Localism Act came into force, nine councils have scrapped the executive for a committee system and at least seven others are considering it. If enough signatures are collected in the borough of Guildford, a referendum vote must be held. On Wednesday 4 June, the Guildford Borough Council (GBC) held an Executive Committee meeting which unanimously approved the Local Plan for public consultation with an unchanged housing requirement figure of 652 houses per annum, which, backdated to 2011, gives a minimum new housing number of 13040. Over the next 17 years that would result in the housing stock in the borough increasing by approximately 25%. On 15 May, GBC’s Scrutiny Committee voted to revise the housing number. It was agreed that this revision should to take place before the Executive Committee meeting on 4 June. GGG therefore considers that Executive governance has ceased to work in Guildford. “I was pleased that the joint Scrutiny Committee accepted my suggestion… to have another look at the housing numbers. …It was hoped that we would have an answer by today. Can you tell me, has this happened? Have you looked at this yet? If you have, what is the housing number and has it reduced as we were hoping it would be?”. It was confirmed that the meeting had not yet taken place. Cllr Juneja indicated that a meeting would take place on Friday 6 June, that the number had not been reduced at present but would be “challenged” by the Executive. That meeting has now taken place and there is still no change to the proposed housing number. It seems that 652 will be included as the housing target in the draft Local Plan. GGG is concerned that the Executive Committee has chosen to ignore the valid recommendation from its own Scrutiny Committee in terms of the plan process. Councillors at that committee appreciated constituents’ and residents’ groups’ genuine concerns at the calculation of the housing numbers, and argued cogently for a consequential revision. The figure for Housing Need is set out in the Local Plan Evidence base in the Strategic Housing Market Assessment or SHMA prepared by GL Hearn. Following public demands for a review of the evidence base, Edge Analytics have reviewed GL Hearn’s original SHMA, and only given it “an amber tick”. Residents and campaign groups have questioned the calculations behind the housing number, and noted specific errors. Despite this the housing target number has only gone down by 18 houses per annum (from 670 to 652). As a result the extent of the reliance that can be placed on the Executive’s challenge is limited. This is not the first time that the process of democratic decision-making within the council has been set aside as a result of the decisions of the Executive. “The Council will enable full public involvement in this reappraisal of the evidence base, especially the Green Belt and Countryside Study, by holding a special joint meeting of the two Scrutiny Committees”. In response to this on 4 March 2014 GBC held the Local Plan Scrutiny Forum to discuss the evidence base. The Forum consisted of two parallel mass workshops, each lasting around 2 hours, with no formal record of the comments made. GGG does not consider that this met the undertaking of full public involvement in the reappraisal of the evidence base, but instead represented a measure of tokenism which has been previously displayed in the consultation process. As a result, GGG is calling for a change in the operations of local government and will present a petition calling for a public referendum on the governance of Guildford Borough Council. This formal petition is available to download from http://guildfordgreenbeltgroup.co.uk, and arrangements will be made to set up an online petition in parallel. There have been no less than FIVE petitions organised by members of the public to protest at different elements of Guildford Borough Council’s (GBC’s) local plan process. If a petition gets more than 500 subscribers then the Petitioner is granted 10 minutes to address the council and up to ten others may speak for 3 minutes each. All of these petitions received well over 500 votes and most were stopped soon after the 500 threshold was crossed. This is an indication of the strength of feeling and level or concern generated by the local plan process. Watch the public speakings presenting their cases in three minutes each. If you are pressed for time just listen to the speeches made by the petition organisers and take 10 minutes to listen to the speeches by Mr Mark Payne, Dr Peter Shaw and Mr Ben Patton. You will be left in no doubt that the local plan is a mess.